With Auto Scheduler Advantage, connecting customers with cars has never been easier. Our software helps keep your dealership organized by making your Delivery Schedule and data easy to access. The last thing you want to worry about in your business is a complicated, messy software system that fails when you need it. The better your system flows, the better you look to clients and customers so you can close the sale and get those glowing five star reviews. Unlike other software services, we developed ours to be easy to use so it won’t get in your way. You'll love these simple and powerful tools! Save hours and money on training since our software is easy to use and navigate. Answer customer questions in seconds with a clear user interface that shows you everything you need to know. 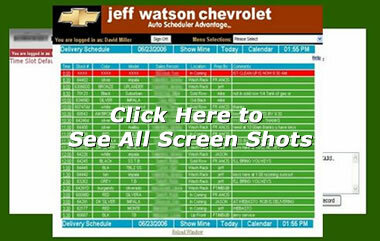 Quickly adjust schedules so you always know what is happening with your employees and customers’ cars. Even on your busiest days, you won’t have to run around trying to find data by sorting through tons of paper, binders, or confusing software. You’re always on top of your game because the Auto Scheduler Advantage is there when you need it most. You will always know the status of the cars for your customers. No more last minute apologies to a customer waiting for a car because your team will always be on the same page. Your entire dealership will become a smooth operating machine. As you know, customers are happiest when they receive the car keys in hand and are able to drive it off the lot right then and there. Pick up the phone and call 586-264-5632 today! Call to take your Risk Free Test Drive TODAY! Auto Scheduler Advantage can maximize time and money for your dealership! I want to Start my 30-Day Risk-Free Test Drive! This is the main screen your sales people will be using to monitor the status of their cars. A simple glance at their computer screen will let them feel secure in knowing their customers' cars are being taken care of. It is color coded for different statuses. Green, indicates the car is ready, red means past due and there could be an issue, purple indicates a message is waiting and yellow means the clean-up process has been started. This screen appears when you click on the time at the side of the Delivery Schedule screen. It allows you to enter the details of the car in the time slot. Sales Managers have access to all cars, however, individual sales people only have access to the cars they enter. To help you manage your resources better, this high level view of the delivery schedule helps you schedule extra porters when you need them. You can also advise your sales staff when would be the best days to schedule cars for pick-up. Each day shows a graphical representation of the number of cars scheduled for the day. This helps you focus your attention where extra porters might be needed. Setup one or more locations where the prep department is most likely to find the car. These locations are selected in the Delivery Schedule Maintenance, so your cars get located quickly by the prep department. When you need to add extra time slots into a specific day, this is the screen you use to select the date you want to adjust. You have complete control over the schedule! This screen is used to setup the default time slots that appear when you enter a new date for the first time. This provides the sales manager the control needed to run a tight schedule. Now you can view a pareto chart of sales performance by salesperson. You can go back and view prior months and easily view how the dealership is doing as well as to how each salesperson is performing. This set of screens is used to setup the Sales People for access to the system. You can specify a username and password for each salesperson for secure access to the service. Each user setup can be limited to access only the functions their group requires.